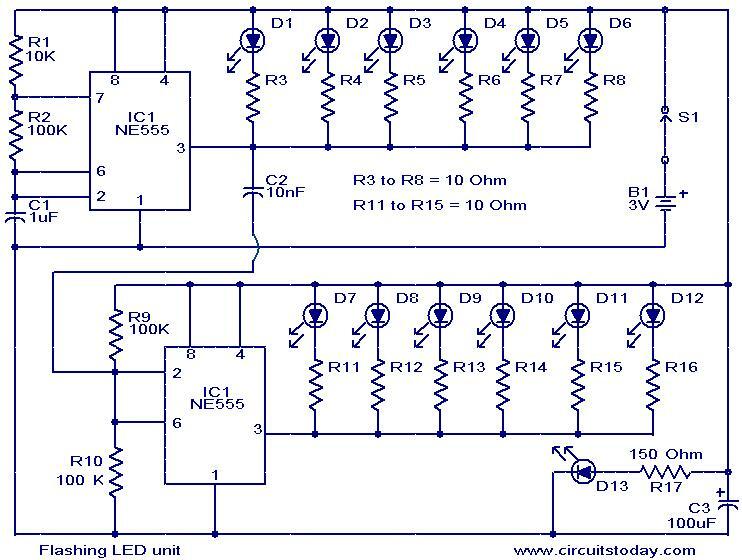 The circuit given here is designed as an LED flasher which produces a rotating effect when the LEDs are arranged properly. The circuit has very low current consumption and can be operated from even 3V button cells. The IC 1 (CMOS NE555) is wired as an astable multivibrator wired at a duty cycle of 50% and 4Hz frequency and drives LEDs D1 to D6.The second IC, IC2 (CMOS NE555) is working as a trigger pulse inverter and drives LEDs D7 to D12.The circuit is arranged such that the ICs sink the current consumed by the LEDs. At low operating voltages like 3V, the CMOS NE 555 performs better when arranged in sinking mode rather than in sourcing mode. The LED D13 remains permanently ON. Arrange the circuit on a good quality PCB. The ICs must be fixed on holders. The switch S1 can be a slider switch. To get a rotating effect arrange the LEDs on a plastic sheet as shown as in the figure. This circuit has possibilities for what I am trying to do. Can it be modified to run 3 banks of leds at 12v? Dear sir, i want to make blinking led circuit using chip 555 with ldr so the circuit can be turn off in daylight. Can you please provide such schematic. Thanks in adv. Can ANy one tell please the ratings of capacitor used……….. I just want 2 ask, i try this project at strip board. But just LED D1-D6 blinking only. D7-D12 not function. I check probably for wire is right. A really nice post sir . I been looking for electronic mini projects . This one seems good to me . I will try to construct it . sir, iam new in building electronic project. i want to make large board like 11*13 size. i want to make govt. iti on board using flashing led circuit . can i use this circuit or not?if not , acn u tell me circuit can be used? hello, we have a school project and we would like to make this one , do you have a PCB design sir? and can we use different color of LED’s? i just ask if what voltage are those capacitors? Hi Din if you want to use 12volt supply you have to modify the circuit. 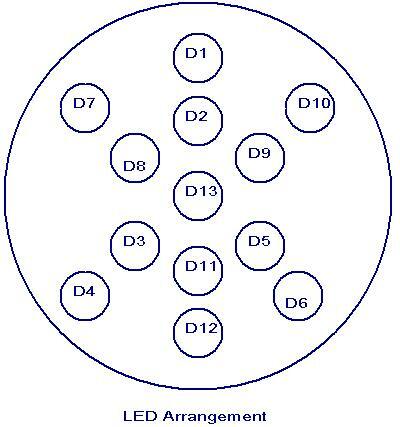 you have to increase the current limitting resistances of all 13 LEDs to 1K ohm 1/4 watt. By referring to diagram, can I use power supply 12VDC? THIS Circuit has infinite Possibilities!!! Hi Anthony As view from the top, (where IC type is printed) there is a dot shown against one of the end pins. this dot indicates pin no 1 from there the number should be counted in the anticlockwise direction. please go through the following site. isthat i don’t understand for example the IC1 NE 555 pins numbers, i mean i don’t know which one is number 1, 2, 8 ext. please if you can help me I will be thankful. I’ve a question. Cannot the first IC(The upper one)take all the load? I mean, if the circuit can be made with only one 555 timer. wow! this circiut is nice. it’s working. i am danish from pakistan, i make here, led police light,. and i want to use ic, in pcb for flashing 14pin,. ic,. i need, 3/4 diffrient mode change flashing mode, plz let me ic number, which ic i use in our pcb thanks. i use 60 led in our pcb board, and i need, 3/4 diffrient flashing mode, plz give me ic number thanks. regards. please tell me the all capacitors volt and which type of led should i use in leds white leds or colourful leds thanks.